Hello Handsomites! Eric and Robbie bring you a super duper fun-filled show today! They discuss Battling Boy vol 1 in Nerd Boy Book Club! They take a look at the week’s newest releases, including Regular Show Skips #1 and Captain Marvel #17! Eric gets quizzed in the Bryan Lee O’ Malley Tweet Quiz, and they have a great discussion in the second installment of Average Fan Interview! All that and more inside! Don’t think, just listen! 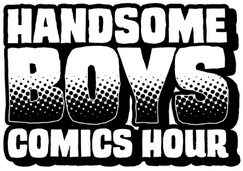 This entry was posted in Episodes and tagged a dance with dragons, average fan interview, batman: black and white, battling boy, bryan lee o malley tweet quiz, captain marvel, iron man, paul pope, regular show skips, snow crash, superman unchained, the disaster artist, the room on November 11, 2013 by handsomeboyscomicshour.